Chirofoam Mattress Review was recently completed by the MattressJunkie.com team. Chirofoam is a premium memory foam mattress designed with 5 key features consumers voted the most important in a new mattress. Sleeping on the proper support has a positive effect on your well-being. Chirofoam was developed with a focus on muscle recovery to relieve back pain and tension in the body. Mattress experts, chiropractors, and consumers all helped out on the mattress design. Chirofoam used consumer data to dictate 5 key features for the perfect mattress. 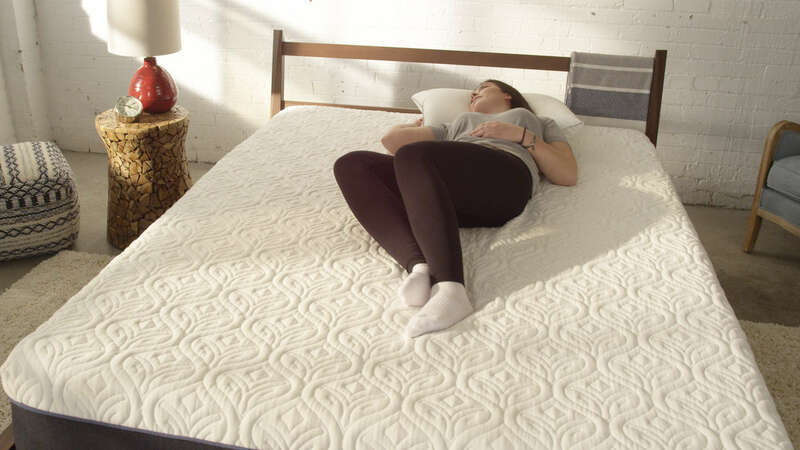 The perfect mattress needs to provide pressure relief, proper back support and alignment, provide a balanced sleep temperature, eliminate motion transfer, and resist sagging. Check out what we thought about the Chirofoam Mattress below. Tell me more about the Chirofoam cover. The Chirofoam cover is a soft and breathable cotton with a durable denim border. The cover is removable and washable. What’s under the Chirofoam Mattress cover? The Chirofoam Mattress is 12 inches in total height and comprised of several foam layers. The top layer under the sleeper’s body is 2 inches of cool gel visco memory foam. This top layer reduces pressure while regulating the overall temperature of the mattress surface. The 2ndlayer is made up of firm support Chirofoam. This sag resistant support layer adds to the overall durability of the mattress. The support foam also gives the sleeper another pressure relieving buffer between the cool gel comfort layer and the core support foam. The 3rdlayer is comprised of Chirofoam Lumbar Support. This posture support layer keeps your back straight while you sleep and adds additional support to the sleeper’s body. The final layer of the Chirofoam mattress is the high density bio-foam core. Made with soy content foam, your carbon footprint is reduced. Does Chirofoam Mattress come in different levels of firmness? No, the Chirofoam Mattress is a 6.5 out of 10 on a scale of 10 being the firmest. Foam always sinks in some with heavier people but overall, Chirofoam is very comfortable for all sleep positions. What type of sleeper does Chirofoam work best with? Side and back sleepers that like memory foam will sleep great on the Chirofoam mattress. Chirofoam has just the right sinkage for my hips and lower back. As a 130 pound female that prefers to sleep on her side and back, memory foam is the most comfortable sleep surface on the market. What type of frame is best to use with the Chirofoam Mattress? 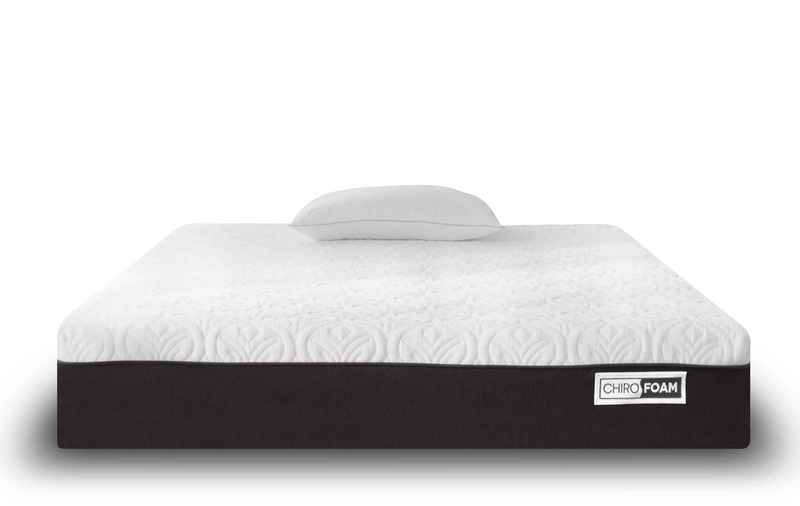 The Chirofoam Mattress sleeps great on a solid box spring, platform bed, or slats. Can I try the Chirofoam Mattress before I buy it? Chirofoam offers a 100 night sleep trial so you can make sure you love the mattress or they will refund your money with that 100 night timeframe. This gives you the freedom to make sure you will love your mattress. That’s how confident Chirofoam is that you will love your new mattress. What type of warranty does Chirofoam offer? Chirofoam offers a 15 year warranty against manufacturer’s defects. How much does the Chirofoam Mattress cost? Is the Chirofoam Mattress free from toxic chemicals? Yes, Chirofoam is Certi-PUR-US certified so it’s free from toxic chemicals. Rest assured you are sleeping on a healthy sleep surface. The Chirofoam Mattress is a well-built foam mattress. Side and back sleepers will sleep extremely comfortably on the Chirofoam Mattress. With excellent temperature regulation, high quality materials, and 12 inches in height, Chirofoam reminds me of much more expensive mattresses that are usually found in brick and mortar mattress stores. Chirofoam did an excellent job balancing support and comfort. You won’t find a nicer memory foam mattress on the market for this price. If you are in the market for a new mattress and like memory foam, Chirofoam would be an excellent option for you. Start your free 100 night trial today……JUNKIE100 saves you $100 on any Chirofoam mattress purchase.